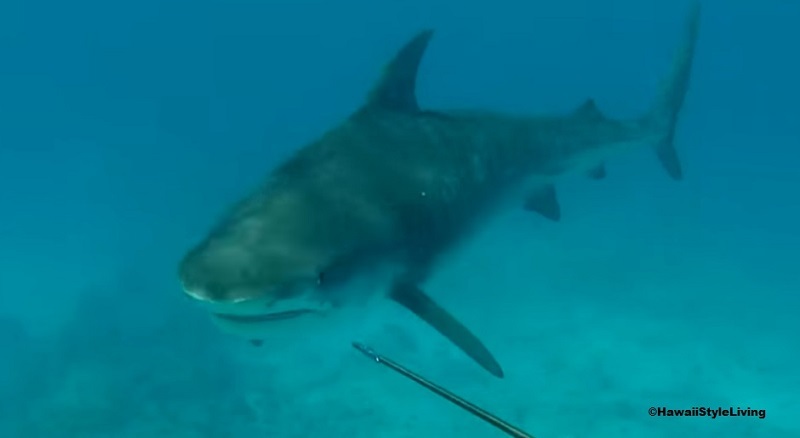 A rare shark-diver encounter was captured by a GoPro video Aug. 20 off the Abacos Islands in the Bahamas when a spearfisherman was bitten on his head and neck by a reef shark. Will Krause, Zach Shipps and several friends were using a GoPro to video their successful day of spearfishing Aug. 20 off the Abacos Islands in the Bahamas. All was proceeding swimmingly until an apparently confused reef shark arrived. The group follows certain rules when they venture out, such as only diving clear water, alerting the boat when they are about to shoot so the fish can be taken out of the water, and after they’ve speared two to three fish, they start looking for sharks and plan to head to another location. They had been in the water around Carters Cay for five to ten minutes when Shipps shot his Hawaiian sling and wounded a fish. On his second shot, Shipps speared the first fish in the area and that’s when the 6- to 7-foot reef shark appeared. Krause was around 30 yards away, approximately 25-feet deep, looking around the rocks and completely unaware that the newly arrived the shark was charging him. As the shark shot toward Krause, it bit down his skull and neck, startling the 29-year old diver. Krause swam to the surface, followed by others in the group who alerted the captain and other divers to the shark’s presence. The group quickly left the water and gathered aboard the vessel Caledonia before heading back to shore. An hour later, the group made it back to shore and Krause was met by a doctor. Krause needed nine stitches to sew up several lacerations on the back of and top of his head. After analyzing the video, it seems plausible that the shark may have thought Krause was also a shark and was attempting to show dominance by biting his head. This is the third shark attack bite off Abaco this year. A 50-year-old female was feeding sea turtles Aug. 15 off Green Turtle Cay when she was bitten on the hand by a nurse shark. She needed several stitches and is expected to make a full recovery. Another spearfisherman was bitten Sept. 23. Maggie Ewing, who lives in the Bahamas part-time, was near Treasure Cay Beach when she shot a hogfish. As the 32-year-old was surfacing, a blacktip shark went for the fish and bit down on the Ewing’s hand. The Massachusetts native was flown by air ambulance to a Fort Lauderdale hospital for treatment. There have been a total of 96 shark attack bites (70 with injury, 21 of which are considered provoked*) publicly reported and verified in 2018. Five fatal**; 33 were reported in the U.S (including one fatal), with 13 occurring in Florida and 3 in Hawaii. Twenty-five have been reported in Australia, one fatal. Eight unconfirmed bites, worldwide, not included in the total count.